Continue shopping “Array Dual Coil – Case of 12” has been added to your cart. Continue shopping “Detox Liner Bags (12 Pack)” has been added to your cart. Continue shopping “Array Dual Coil – Case of 6” has been added to your cart. Continue shopping “4 Inch TENS Pads” has been added to your cart. Continue shopping “AlkaStik – Alkalize your water in your own bottle” has been added to your cart. Continue shopping “Accel Cleaner (1L) with Sprayer” has been added to your cart. Continue shopping “UltraStream Replaceable Filter – White” has been added to your cart. Continue shopping “3-in-1 Detox Foot Bath Carrying Bag” has been added to your cart. 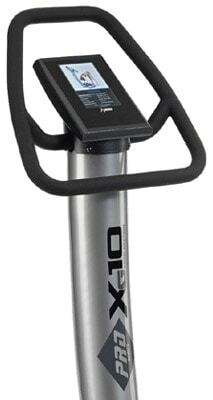 The DKN Xg10 Pro is an amazing 12G strength vertical vibration machine. This vibration platform leads the industry and is the MOST ADVANCED with a 3D virtual coach and 12 preset programs. Not to mention the award winning sleek design and easy to follow 3D virtual coach. Don’t have time for your workouts? Get the benefit of a 1 hour workout in just 10 minutes! This machine helps accelerate weight loss and achieve a more toned body. The appearance of cellulite is controlled, which leaves you with smoother and tighter skin. Other benefits include improved balance, strength, flexibility and endurance, increased energy levels, better mental focus, and improved sleeping habits. Additionally, blood circulation is improved, bone growth is stimulated, metabolism is enhanced, and the recovery of injured muscles is sped up. 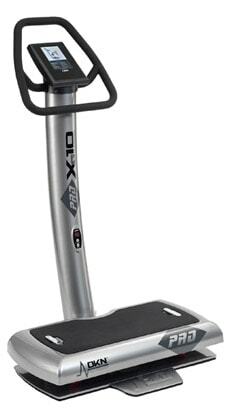 The DKN Xg10 Pro – Vibration Trainer was specifically developed considering the professionals: this model makes Intensive Vibration Training exercise accessible and affordable for professional or home use. Making it super easy for you to workout! The unique, sleek design, and the compact size of this machine, occupies less floorspace, and fits into any fitness studio or wellness centre. 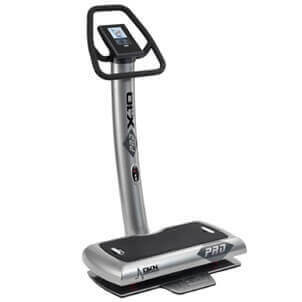 The DKN Xg10 Pro Vibration Trainer has a well balanced platform or also known as vibro plate, a low entry step, and a great power range, reaching an incredible 12G. 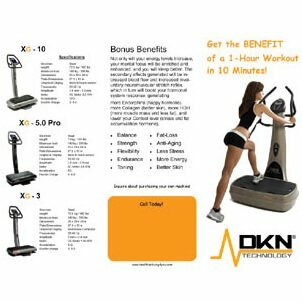 The DKN Xg 10 Pro comes with 2 upper-body straps, a thick high density mat, an interactive training DVD, a personal training guide and a vibration exercise poster. 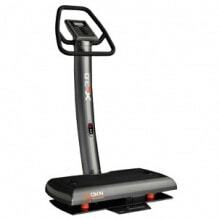 The greater frequency range, in between 20 to 50 Hz, with interval steps of 5 Hz, the touch screen, back-lighted panel, with DKN’s integrated virtual coach, visualizing graphic exercise positions, and with 12 integrated programs: the DKN Xg10 Pro Vibration Exercise Machine matches intensive exercising. 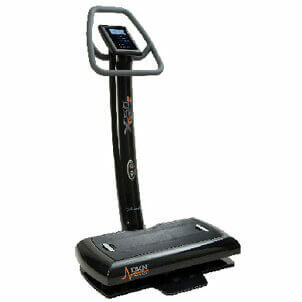 This model has revolutionized the whole body Vibration industry with it’s beautiful 3D screen! The construction is 100% high grade steel, reinforced with carbon fibre, to control the high performance acceleration. This machine is made for intensive home use as well as professional use. If you’re looking for a high quality machine that needs to be used all day everyday the DKN Xg10 Pro is the right vibration trainer for you. The Plate produces a vibration through which energy is transferred from the vibro platform to the body. By standing on the Vibro Plate you will notice how your body automatically adjusts to the vibrations. This mechanical stimulus produces a stretch reflex which, depending on the selected frequency, results in muscles vigorously contracting 30 to 50 times per second. Exercise causes the body to tire; rest allows the body to recover. By repeating this process, the body adjusts to the level of effort, resulting in an increase in physical performance. This phenomenon, called super-compensation, similarly occurs when training on the Vibro Plate. However, compared with traditional training methods, greater results are achieved and hormonal production is increased in much less time. Each set is performed no longer than 30, 45, or 60 seconds in length, and training sessions on the Vibro Plates need to be performed no more than 3 to 4 times per week with each session lasting about 10 minutes of actual time on the DKN Vibro Plate. This Vibration Trainer offers a wide range of possibilities for use in the areas of Sports, Health, Fitness, Medical, Beauty & Rehabilitation. 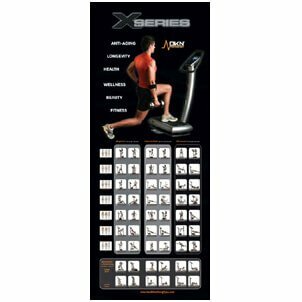 Or many people do buy this for home use as well because the 12G Vibration Plate and the extra large display. 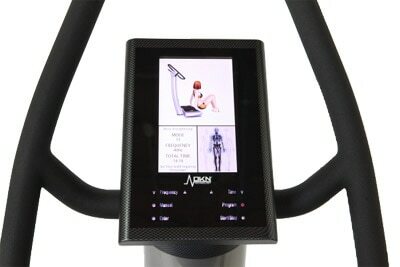 The screen is sleek and provides the user with the next exercise along with what muscles are being targeted. DKN really only has two competitors in the whole body vibration market and those two are; VibroGym and Power Plate. Both these companies make quality vertical vibration machines just as DKN. The difference is DKN has been able to bring very high quality vertical vibration systems for a lot less then it’s competition. We are talking about real Vertical Vibration, not Oscillating, not Tri-planer or whatever the next word “the new company” comes up with for their marketing needs. All the medical studies out there are on vertical vibration. When the astronauts came back from space they used vertical vibration, not oscillating vibration. It is very important for you to do your research on the machine that you are thinking of buying and do not buy just based on price. 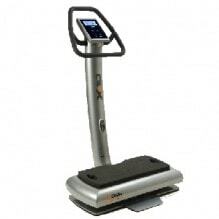 DKN Vibration trainers are very reliable whether they are being used for personal us or commercial use. There is nothing more frustrating then going out and buying something you want and always having it broke down or possibly the company disappears or closes up shop. 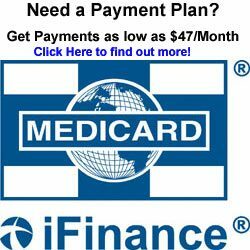 Consumer financing with Low, Easy payment programs starting as low as 47.00/month. OAC. 1.1 When per forming exercises ( i.e., squats lunges, etc) on the “WBV” Device, are there any differences in exercise form as compared to traditional strength training exercises? added load of a heavy barbell. 1.2 Can “WBV” Device training improve flexibility? Increase frequency – 30Hz, 35Hz, 40Hz, 45 etc..
1.5 I wonder if the muscles are trained effectively with the straps, as I don’ t feel much while doing the biceps-cur l and side and front raises? mode in these exercises. For the extensors such as shoulders, chest and triceps you can also perform the exercises where direct contact with the plate is established. 1.6 Should I do my “WBV” Device exercises before or after my cardio training? You can integrate “WBV” Device training anywhere in your exercise schedule. Some people prefer to start with weight training, followed by cardio-vascular training and then on to the massage-exercises on the “WBV” Device. However, you can adapt a schedule according to your own preference. There is no specific order that must be maintained in performing the different components of your training session. If you use the machine according to our instructions and you are not suffering from any type of migraine, this is caused by not drinking enough water or fluids containing glucose prior to the training. Recent scientific research has shown that almost 70 % of the population is suffering from dehydration, as a result of drinking coffee and alcohol, smoking, stress and not drinking enough water. This means that a lot of people do not have enough fluids in their bodies. Over 50 % of our bodies consist of water, which is why the fluid balance is of utmost importance. This is augmented by diets where people are encouraged to eat less, which will decrease the amount of fluids taken in even further. This group should in fact drink a lot more water. Training on the “WBV” Device causes an enormous activation of the lymphatic system that will result in a loss of body fluids. Therefore, we advise people to consume at least 10oz of a drink containing glucose, preferably half an hour before training. 1.9 Can I use the “WBV” Device barefoot? exercises without rest is that the heart rate remains elevated during the entire schedule, intensifying your training and providing you with a cardiovascular stimulus as well. 1.12 How old should I be to star t training on the “WBV” Device? 1.13 My mother is 72 years old; can she train on the “WBV” Device? “WBV” Device 3 times a week for 6 months, after which a tremendous increase in bone density was measured. While using the “WBV” Device, one can activate their muscles in an easy, safe and simple manner, without having to use external objects such as weights, dumbbells or dyna-bands. There is also a lot less strain put on the joints, ligatures and tendons during vibration training than with conventional weight training. All of the results that can be achieved by young people are attainable for the elderly as well. 2.4 My doctor /specialist doesn’t know the “WBV” Device, what should I do? in the world of health and fitness clubs, but also in the area of medical and rehabilitative care. If your doctor, specialist or physiotherapist would like to know more about the “WBV” Device and its possible applications, have them visit our web site at Several extensive scientific studies are being carried out at this time. 2.5 I am a diabetic. How can I train on the “WBV” Device? 2.6 I suffer from arthritis. How can I train on the “WBV” Device? These days there is a lot of media attention and scientific research aimed at the effects of vibration training on the human body. Our body was made for movement. We have been perfectly equipped to absorb all of the vibrations we are confronted with in our daily lives. However, the amount of mechanical vibrations we are exposed to has increased enormously over the last few centuries. Truck drivers, forklift drivers, construction workers and helicopter pilots absorb a lot of vibration on a daily basis. The complaints they suffer, mainly in joints and spine, cause tremendous problems. However, there are some fundamental differences between vibration exposures in the work place compared to vibration from the “WBV” Device. While training on the Plate you are actively using the vibrations, which are being absorbed in the muscles instead of the joints. The duration is also much less. The total amount of time of a training session is not even close to the time that people are exposed to vibrations in a working environment. The “WBV” Device complies with the I.S.O. standards for industrial use, provided that training does not exceed 2 hours a day. For that matter, it is useless to train longer than 20 minutes or more often than 3 or 4 times a week. If you use the “WBV” Device according to our instructions and under certified supervision, vibration training is many times safer than any other sports or training activity. The “high” mode is more effective because the extent of the movement is twice as much as in the “low” mode. It is very important to build up the training schedule gradually, as indicated on the programs we have developed. Your body will have to adapt to vibration training before you can intensify your schedule. 3.2 Do the conventional rules of fitness apply to the “WBV” Device? Such as a two day rest period in between sessions and training the larger muscle groups before the smaller groups? and follow with the smaller muscle groups. 3.3 Does the “WBV” Device improve circulation in the entire body, or just locally? 3.4 What are the advantages of training dynamically? 3.5 Should I do cardio- training as well? 3.6 Is training on the “WBV” Device effective? your ability to cycle by riding a bike, not just by standing on the “WBV” Device. 3.7 Why do you star t with so few exercises, and does my schedule intensifies gradually? As with all sports or physical exercise, we are dealing with certain physiological principles in vibration training. One of these principles is the fact that in time you will have to train more and longer to get even a fraction of the result (because the body eventually adapts to the stimulus and will be able to deal with the training much more easily). more rigorous exercise when a training stimulus is received at the right moment of recovery. Practically speaking,this means that any stimulus should be repeated regularly in order to achieve the required results, decided by and depending on the nature and the intensity of the stimulus. However, these results are reversible. If you stop training, the results will disappear in time, as the body needs a constant stimulus in order prevent regression. 3.8 How does the “WBV” Device cause muscles to contract automatically? 3.9 If I quit training after having used the “WBV” Device intensively for a number of weeks, how long will the effects last? “WBV” Device after having trained intensively, the effects will slowly recede. However, the speed of this recession is highly individual, and depends on a number of other matters as well. 3.10 Are there any long- term effects of vibration training? 4.1 What is the difference between “high” and ” low” mode? The “Low” and “High” refers to range of plate movement and directly affects the intensity of the exercise. In the low mode the plate movement ranges from 2 – 4mm. On the high mode the plate movement is 4 mm. It is this range of plate movement that enables one to gradual increase their exercise intensity as they progress. It is always recommended that individuals begin their “WBV” training on the Low mode, at least during their initial phases of exercise. 4.2 Are there any other exercises than the ones on the poster ? We have developed a number of exercises that are extremely well suited to all kinds of specific targets. DKN“WBV” Device International is presently working on the development of a number of exercises specifically meant to assist in recovery of injuries and several other physical afflictions. We are also working on exercises to increase joint flexibility and mobility. 4.3 Is it possible to replace my entire fitness program with a “WBV” Device program? enhance co-ordination of upper and lower body. 4.4 I have questions my own gym cannot answer . Where can I get more information? Have your gym contact Healthier Living 4 You or visit our website which contains a substantial amount of information and should be able to answer many of your questions. 4.5 How long has vibration training been around? Want to know why the DKN Vibration Trainers are the way to go? Watch the video below. Learn how to do a Total Body Workout! Learn how to do a Lower Body Workout! Learn how to properly do a Abdominal Workout! Learn how to get more Flexible with this neat Move you can do consistently each day. 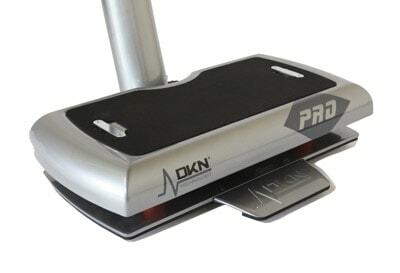 Learn some advanced Moves with the DKN Vibration Trainers! Learn how to have a great massage with DKN Vibration Trainers!